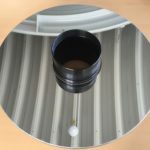 Optical wonder is used to clean world´s most expensive astronomical mirror surfaces. It certainly is good for cleaning hard coatings of camera lenses. Greatest care has to be taken to not "drown" the front lens in too much cleaning fluid and have the fluid flood all the lens from above. Only put Optical wonder onto the cleaning cloth when preparing the cleaning operation.